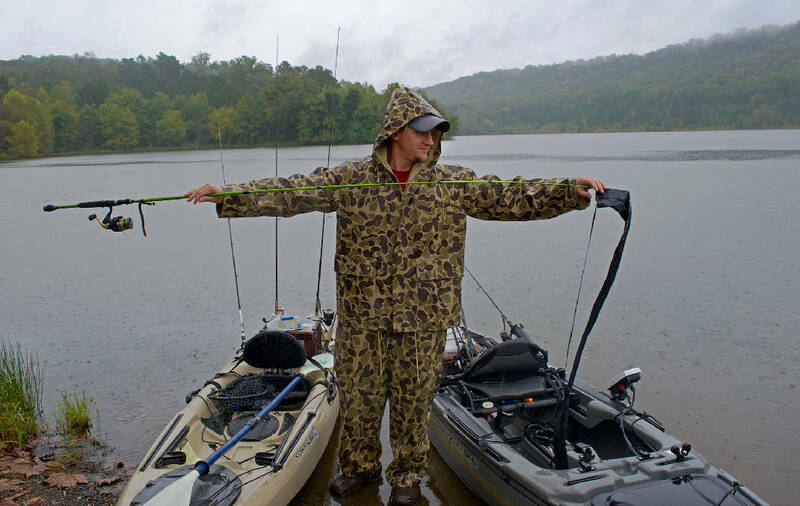 Seth Lassitter prepares his rod for a day of fishing at Haig Mill Lake in Dalton, Ga. The park surrounding the lake hosted a grand opening celebration Saturday morning. Photo by Mark Pace /Times Free Press. Haig Mill Lake in Dalton, Ga., is pictured Saturday morning. 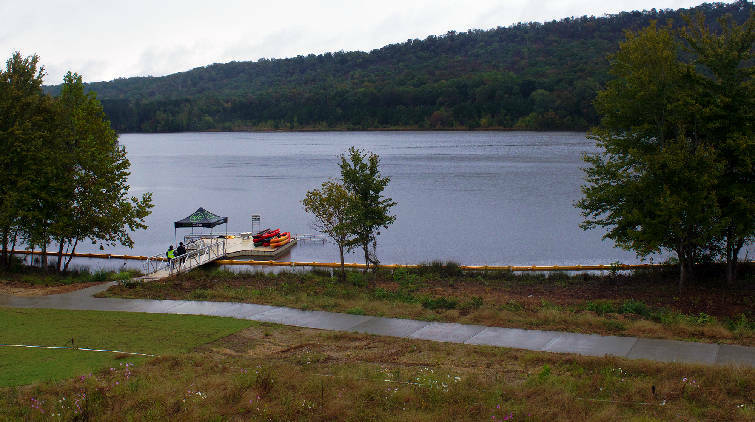 DALTON, Ga. — A dreary, rainy morning couldn't dampen the excitement for one of the biggest public park projects in Dalton history. Residents, city leaders, volunteers and other Dalton community members went to the newly constructed Haig Mill Lake Park for its grand opening celebration Saturday morning. The event featured vendors, local groups, giveaways and festivities as attendees ducked under canopies to stay dry while children played in the rain. "We love it. I'm really excited. It looks like a really family-safe area," Cenaida Sosa said. "It's nice, being in Dalton, for the city. This is great." Sosa came to the park with her husband and two children. The Dalton residents live nearby and are eager for a new, scenic place to enjoy as a family. "It's close, and it's nice with the lake and big walking area," her husband, Ivan Sosa Sr., added. "We needed something new for the kids, too"
The more than 300-acre park is situated around the 126-acre Haig Mill Lake. It has fishing piers, a boating dock for paddleboats and canoes, picnic areas, an amphitheater and outdoor classroom for local schools, and it will have a large, nature-themed playground in the coming weeks. The outdoor classroom will be used by the local elementary school and other students all the way through college. Similar programs already exist in the community and have been a success, Dalton Parks and Recreation Director Mike Miller said. The park is the largest in Dalton and has already had visitors despite not officially opening until Saturday. Fishermen in kayaks have been regulars at the park, and several were out on the water on the cool Saturday morning. "I'm surprised," Miller said. "The turnout of those who have come already has been great, and as the day progresses, more people are coming. It's been pleasantly welcoming." The park will have kayak rentals — either through the parks department or a contractor such as Rock/Creek. The outdoors outfitter and the parks department have already hosted a flatwater kayaking clinic that was popular among residents. It's something Miller hopes to continue. Haig Mill Lake Park is nearly complete. Several small projects and the installation of the playground will be finished in the coming months. The park is open 7:30 a.m. until 6 p.m. The hours will shorten next month through winter and will expand again in the spring. Typically, the park will open shortly after dusk and close shortly before dark. Hours will be posted at the park, Miller said.